When you think "All-American" you may think "apple pie." Well, sorry to be the bearer of bad news, but you're wrong. 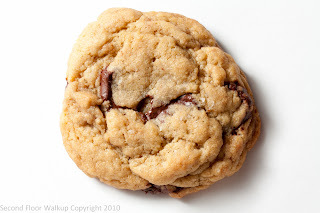 Chocolate-chip cookies are the essential American baked good. Apple pie dates back to the medieval times (just see the article over at Gode Cookery, the infringing of which started the internet firestorm against Cooks Source magazine). 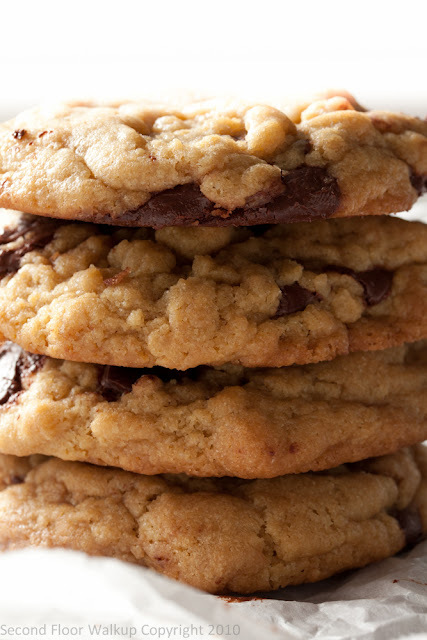 Chocolate-chip cookies are a true American (accidental) invention. The Nestle Toll House recipe, found on the back of Nestle chocolate chip packages, is based on Ruth Wakefield's original recipe. This recipe is a good starting-off point, and a classic go-to when you're in a pinch. I adapted mine based on info from a New York Times article, in which it was revealed that Wakefield's recipe called for chilling the dough overnight, as well as a bit of my foray into experimenting with baking science (see notes at end of recipe). Notes: The cookies will seem underbaked - this is necessary to maintain a chewy texture. 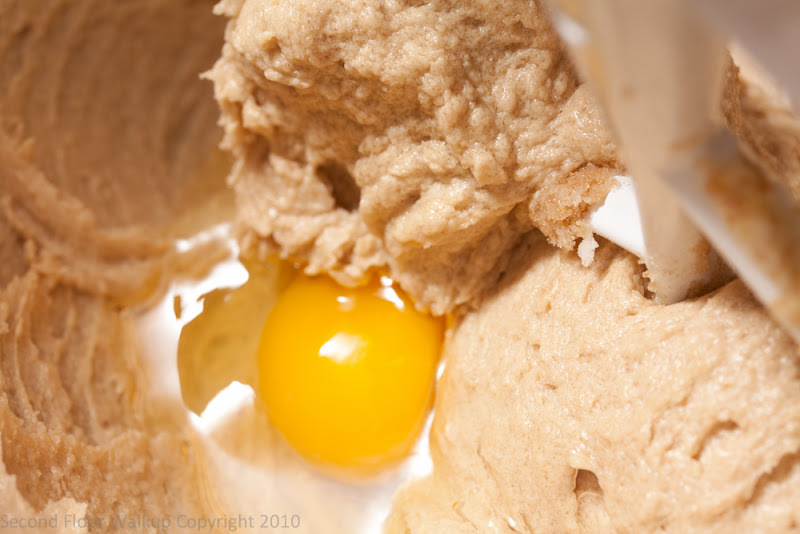 The edges will be just browning, the top will be cracking, and the dough in the cracks will seem moist. As they cool, moisture is evaporated and they will set into perfectly chewy cookie. 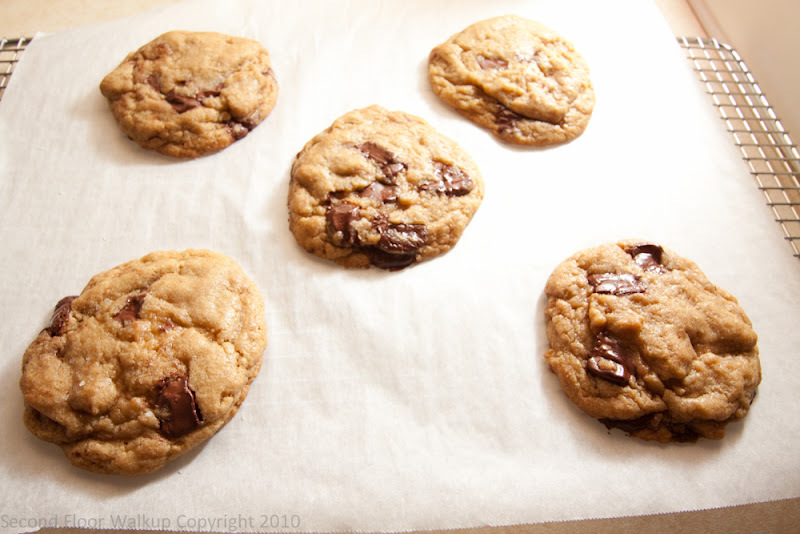 If you bake them until they appear "done" they will end up crispy when cooled. 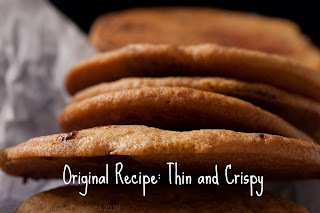 The science of the cookies: My first recipe resulted in cookies with too much spread, so they were thin and crispy. This basically meant that the dough lacked the right amount of leavening agents. (a) Melting the butter. 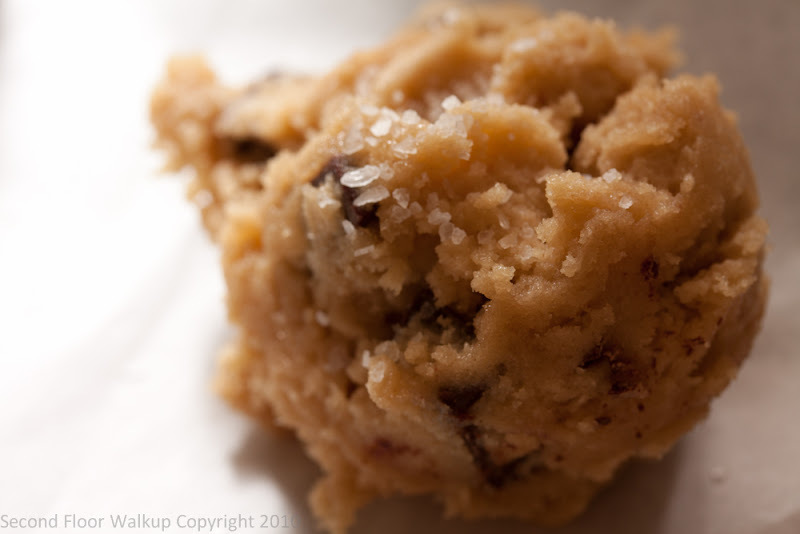 When heated, any undissolved sugar crystals melt, causing the cookies to spread more. Dissolving the sugar into the melted butter corrects this problem. 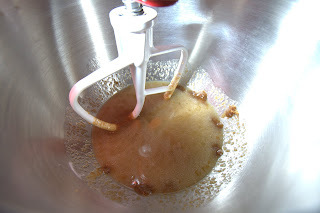 (b) Replace some of the granulated sugar with brown sugar. Same reason as melting the butter - brown sugar dissolves more readily than granulated. You could also use caster sugar. (c) Baking powder. Baking soda creates CO2 (and thus the dough rises), when it reacts with acidic ingredients in the dough (such as brown sugar). 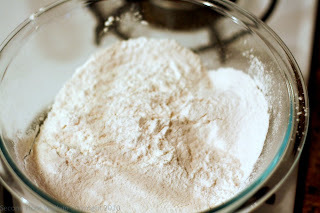 Baking powder is baking soda mixed with an acidic ingredient, so it will rise without the need for acid in the dough. Adding more brown sugar provides more acid with which the baking soda can react; baking powder will cause the dough to rise even more. 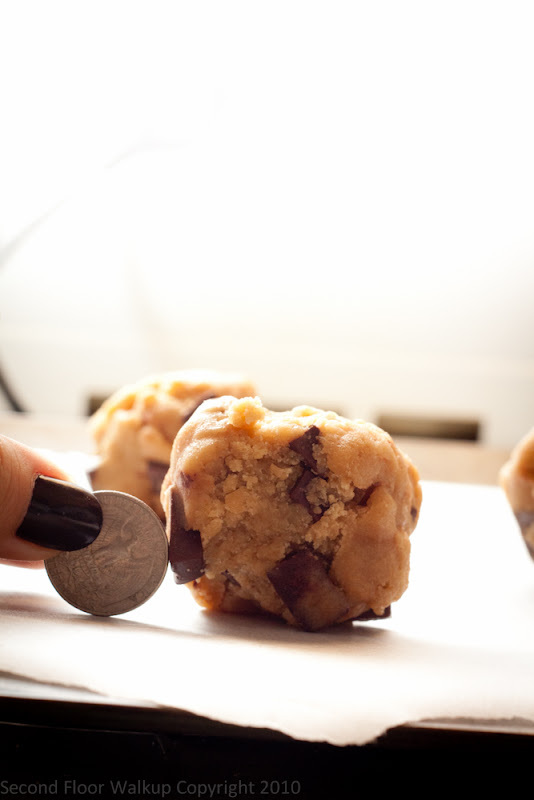 Basically, we give the dough its maximum rising potential. Also, if the dough is more alkaline (meaning too much unused baking soda), the gluten fibers in the flour will develop more and thus be longer (meaning more spread). (d) Chilling the dough. Besides the fact that chilled dough tastes better than unchilled, there is a scientific reason for the difference. In order for an even texture and flavor to develop, the moisture in the dough needs to be evenly distributed. 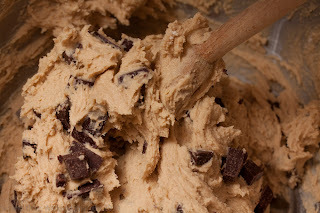 One way to do this is to mix the dough thoroughly. Overmixing, however, over-develops the gluten, which results in tough, unpleasant cookies. 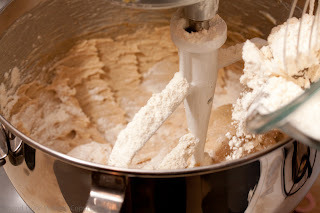 If, instead, you chill the dough, the moisture can distribute evenly without the problem of over-developing the gluten. That sounds good. 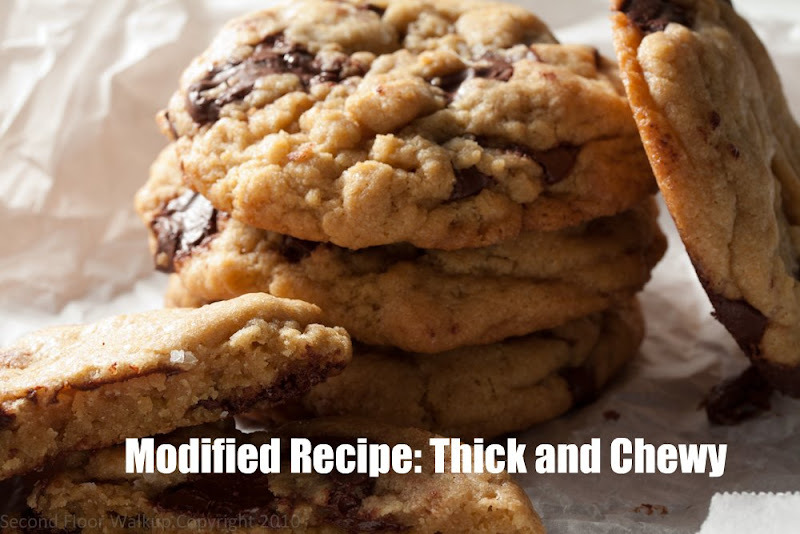 I will have to try it with my Gluten Free Flour and see how it tastes. Will have to hide the dough from Dad so he does not complain about not having the instant gratification of fresh baked cookies. Just baked the cookies with Gluten Free Flour and they were great. I only baked half the batch and will bake the rest tomorrow for Dad. I made these today for a conference at work and used my gluten free Mr Ritts flour. Everyone loved them and could not believe they were gluten free. I directed them to your blog. thanks for the recipe it was a hit. These are the BEST cookies EVER!! Thanks for this amazing recipe. You seem to know exactly what you are doing in the kitchen. Happy cooking!